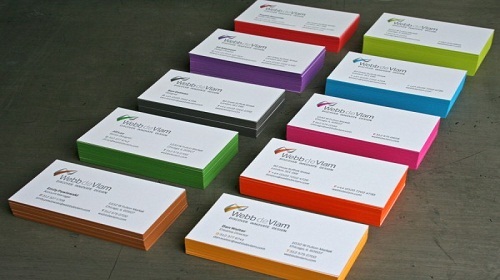 Business cards are the lasting impression of you and your business. Your business card can be either thrown away when you give it to someone or kept for reference in the near or distant future. Making your business card great, the one which will be kept and referenced by your contacts, is a vitally important asset to you and your business. Most importantly you need to have original and distinctive art work to make your business card stand out. Your prospective client must like what he sees and feels. Do you want something bright and eye catching or quietly elegant, professional or modern? You really need to be clear on your style, don’t mix things up; it will be confusing to your clients. When your client looks at your business card, you want him or her to know a lot about you. Are you modern and up to date or are you more laid back and serious? Whichever fits for him/her and how you want to show that you are professional and serious about both your and his business. Your business card is your first, and sometimes only, contact with a prospective client. The value of this contact cannot be over-valued. This is your entry into your client’s world so it is vital that your card should be a real statement telling him that by keeping your card he will always be able to reach you and work with you, and most importantly remember who you are, and what you represent. Your choice of card will show him immediately that you are promoting a brand which you are proud of and which will fit with their business. Remember, less is more, leave off anything that is superfluous; do you really need your postal address and fax number to appear on your card? Use the space for your brand. We are able to show you how you can achieve a lasting relationship with a new client just by having given them a card which they have kept and can refer to later. Our business is built on personal and highly professional service. We really like to help out clients. Beware of the dreaded temptation to “IDIM” – (I designed it myself!). We often see cards in different industries, picked from the same “free” website, with common pictures and fonts. They may look great to you, but they also look great to the thousands of others using the site. With limited exceptions, it’s fairly easy to spot an inexpensively produced card. When you choose to “go cheap” on your business cards, what message does that send to those with whom you wish to do business? Are you really doing yourself any favours by missing out on the opportunity to start building a positive brand image right from the start? The difference in cost between “cheap” and executive cards is really irrelevant, considering the message that your card carry’s. Send us a quote request from our website here, or give me a call on (07) 5636 7736 to discuss your requirements. You also need to ensure that the images and logos on your cards are hi-rez, as low-rez images will print really badly, and you will be disappointed in the result, so remember, we are here to show you how to make a great business card.